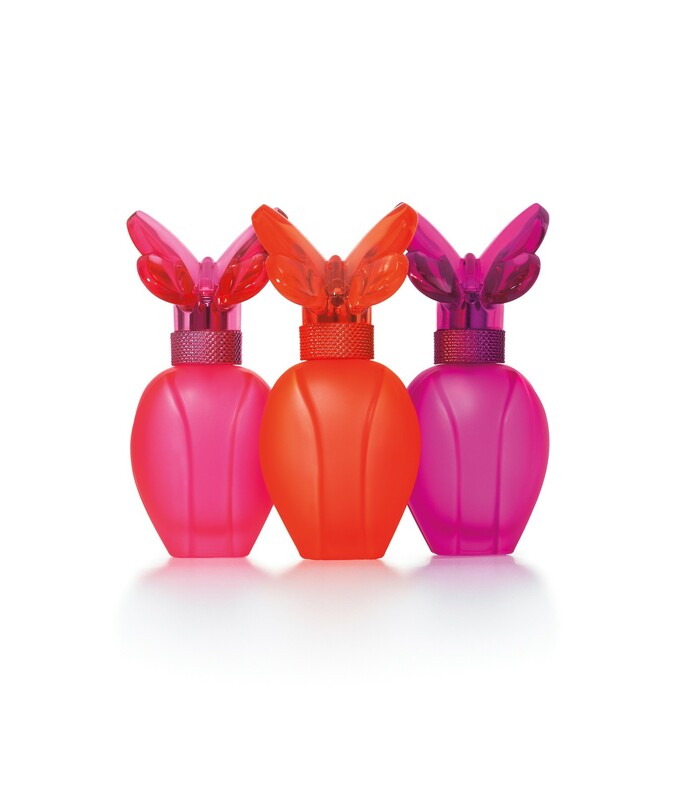 Mariah Carey is remixing her fragrance collection with Lollipop Splash the Remix, a trio of limited edition scents set for a July launch. The collection is a flanker effort to Carey’s Lollipop Bling trio, which launched last July as a strategic partnership with Elizabeth Arden Inc. and Bazooka Candy Brands, a division of Topps Co. Inc. That partnership has since ended. Carey has been launching scents with Arden since 2007. Each scent in the new collection — Inseparable, Never Forget You and Vision of Love — is named for a Carey hit. "Mariah is always reinterpreting and mixing her music, keeping her brand relevant,” said Marcy Fisher, vice president, North America fragrance marketing at Elizabeth Arden. “She wanted to have the same effect with her fragrances, so she decided with this project to approach it from that perspective." Inseparable, in a pink bottle with Carey’s signature butterfly, has notes of raspberry, mango, pear, jasmine and orange flower; Never Forget You, in an orange-tinted version, features notes of jelly beans and golden peony, and Vision of Love’s notes include French macaroon and purple jasmine. It is in a purple bottle. "The fun notes are intended to demonstrate that fragrance shouldn’t be so serious," said Fisher of the playful notes like jelly beans and macaroon. Clement Gavarry of International Flavors & Fragrances developed Inseparable, while Givaudan’s Claude Dir and Marypierre Julien did Vision of Love and Never Forget You. Each eau de parfum is one ounce and will retail for $35, exactly the same pricing as Honey, Mine Again and Ribbon, the three scents in the Lollipop Bling trio. The scent trio will be carried at about 2,300 department store doors, and will be supported with national advertising this fall, as well as with a digital and in-store campaign, which will be rolled out at launch. "Mariah's fans really love the digital aspects of her projects, so that will be a focus,” said Fisher." Also, the bright colors of the bottles really pop on counter, so we’re planning an in-store presentation designed to emphasize that.” Vials on card and scented stickers will be among the vehicles used for sampling, she said. While Fisher declined to comment on projected sales for the trio, industry sources estimated that they could generate retail sales of $8 million to $10 million combined.